On a couple of my trips to Israel a leg of the journey was on El Al, the Israeli state airline. There are a couple of memories from those experiences. One, that security was so thorough all of us felt guilty of some crime even though we were as virtuous and unthreatening as could be -- and that was in the days before 911. 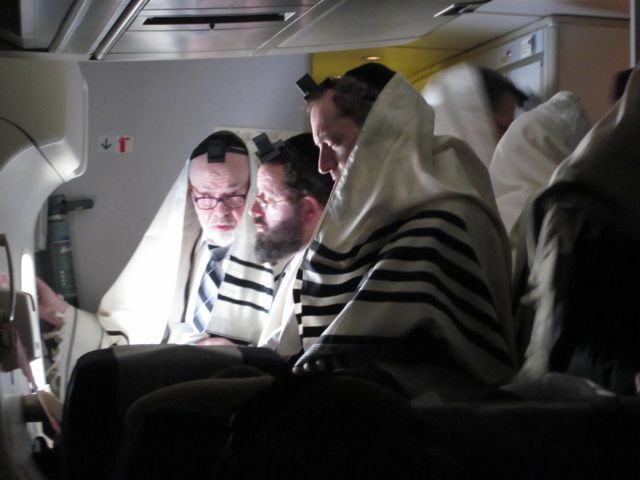 The second was that Orthodox Jewish men went to an area of the aircraft to pray with the nodding rhythm of their tradition. It was both odd and captivating that they were so devoted, not to mention the willingness of El Al to accommodate them in this prayer practice. This didn't come about because El Al saw the light about gender equality. The software development giant NICE is situated in Israel and recently informed the airline they would no longer fly with it if the policy wasn't changed. Apparently the economic benefits of serving business outweighed religion in this case. Still, it was a good decision. Praise Yahweh that gender-based religious discrimination is being challenged wherever it persists. This will be a long slow process, to be sure, but we can pray anywhere we are that it will continue.